A basic understanding of the reactions of nitrogen in soils provides a solid foundation for making wise nutrient stewardship decisions. 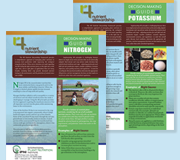 This series of fact sheets, written by IPNI staff, covers the major nitrogen fertilizer transformations that occur in crop production. A series of fact sheets written by scientific staff of the International Plant Nutrition Institute (IPNI) that is focused on essential plant nutrients and their use. Nutrient Source Specifics are one-page fact sheets highlighting various fertilizers and nutrient sources. Written by IPNI scientific staff, these items are primarily for educational use by a non-technical audience. Consult with a local expert regarding specific recommendations on nutrient use. Vous cherchez de brèves informations sur la production, l'utilisation agricole, les pratiques de gestion et les propriétés chimiques des engrais couramment utilisés? Les sources spécifiques des éléments nutritifs sont présentées sous forme de fiches d’une page mettant en évidence différents engrais et sources d’éléments nutritifs. Rédigés par les scientifiques de IPNI, ces articles sont principalement destinés pour un usage éducatif à des lecteurs non spécialistes du domaine. Consultez un expert local concernant des recommandations spécifiques sur l'utilisation des éléments nutritifs. Está buscando información resumida de la producción, uso agrícola, prácticas de manejo y propiedades químicas de los fertilizantes químicos más conocidos? Las fichas técnicas Fuentes de Nutrientes - Específicos, son páginas individuales que resaltan varios fertilizantes y fuentes de nutrientes. Escritas por personal científico del IPNI, se enfocan principalmente para uso educacional dirigido a una audiencia general. Para recomendaciones específicas de su uso, por favor consulte con su agrónomo o especialista local. The Research with Impact series highlights case study examples of solution-driven research supported by IPNI. The objective of the Site-Specific Management Guidelines series is to provide a mechanism to assemble expert knowledge in a timely fashion on site-specific management in a form useful to farmers and their advisers. Each Guideline addresses a specific issue related to site-specific soil and crop management. Currently there are 45 titles in the series, which can be accessed from the list below. A series of three articles reprinted from Better Crops with Plant Food. The articles cover the behavior of some of the commonly used sources of nitrogen, phosphorus and potassium for organic crop production.